Intergalactic Battleship is a cool adaptation of the famous board game called Battleship. The rules are slightly different but very interesting. Earth is under attack. A powerful alien race has devestated our planet's defenders. As a commander of our remaining fleet, your forces are all that is left standing between us and annihilation. Try to save the world we love! Destroy each of the alien ships to save our planet. 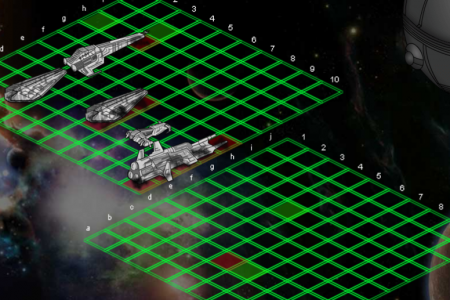 Firtly, drag your ships onto the grid. Then, in the moment when battle will has started, click on the enemy grid to locate and destroy each of the enemy ships. You can play on easy, medium or hard level of difficulty. Play Intergalactic Battleship for free and save our world.